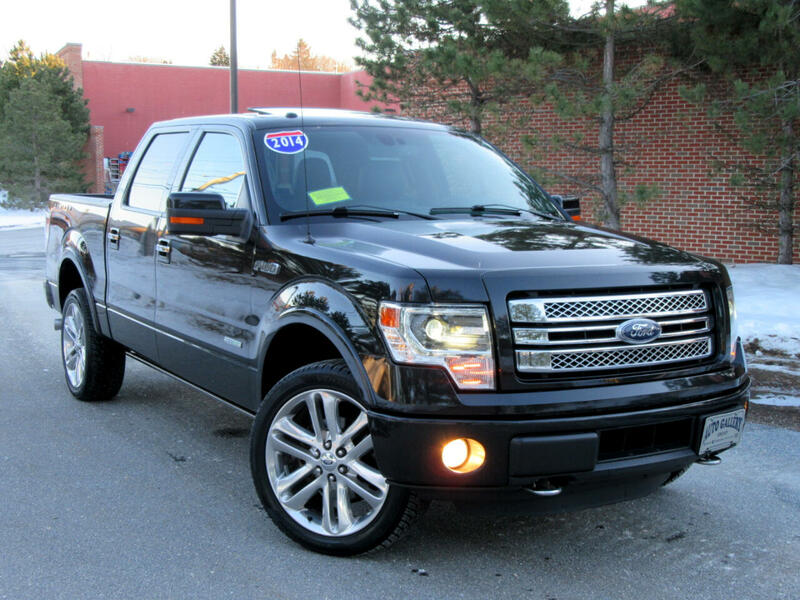 Let's check out this one, you won't be disappointed!, Clean Carfax /No Accident Reported, Immaculate condition, Service records available, Navigation GPS, Back Up Camera/Parking assistance, All wheel drive, Moon roof/Sun roof, Bluetooth/hands free cell phone, New tires, F-150 Limited, 4D SuperCrew, EcoBoost 3.5L V6 GTDi DOHC 24V Twin Turbocharged, 4WD. 2014 Ford F-150 Limited Black 4WD 6-Speed Automatic Electronic EcoBoost 3.5L V6 GTDi DOHC 24V Twin Turbocharged Recent Arrival! Welcome to Wakefield Auto Gallery, we are located at 79 Water Street, Wakefield MA 01880. We are a full service pre owned auto retailer with full reconditioning, on site service department and registry runner and insurance services. We offer hassle free internet special prices and a relax car shopping experience. In addition, we offer a wide-variety of finance programs tailored to your financial needs. We have special finance programs for first time buyers, international drivers and people with bad credit history. Our prime finance programs also offer as low as 2.49% interest rate for qualified applicants. For further information browse our website or feel free to contact us Phone: (781)-245-4711 Fax (781) 245-4788 or email:wakefieldauto@gmail.com we are really appreciated your business! check out our BBB A+ rating! Excellent financing programs and extended warranty available. Call us at (781) 245-4711 or log onto www.wakfield-autogallery.com for full vehicle details. Hours: Mon-Thu 9am-7pm, Fri-Sat 9am-6pm, Sun 12pm-4pm. Address:79 water Street Wakefield MA 01880. BBB A+Rating business since 2007. Sales tax, registration, inspection , dealer documentation fee and any other associated charges are not included. Inventory is updated frequently, however there can be a lag between a vehicle sale and the update of online inventory. Please call to verify vehicle availability and information like extra keys, manual, etc. before visiting the store. Fuel economy is an estimate as MPG varies depends on driving conditions and habits. Dealer is not responsible for vehicle history reports (CarFax, etc) updated after the vehicle purchase.